The village of Grazalema is in the north east of Cadiz province, at a height of 800m, in the mountain range bearing the same name Sierra de Grazalema . In 1977 this area was declared a Biosphere Reserve by UNESCO due to the exceptional variety and wealth of its fauna and flora. 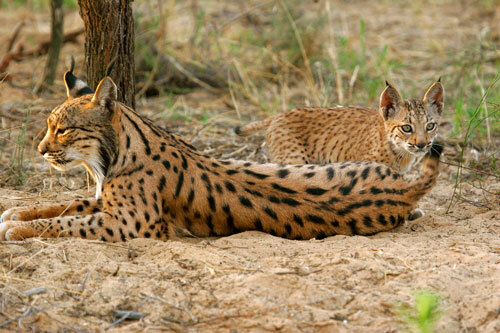 In 1984 it was made the first Nature Park of Andalucia by the Junta de Andalucia. The park envelopes several other towns and villages, and also takes in a part of Malaga province along the border with Cadiz . 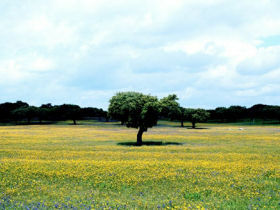 El Bosque, Ubrique, Zahara de la Sierra, Benaocaz, Prado del Rey, El Gastor and Villaluenga del Rosario are within the Cadiz side of the park, Benaojan, Cortes de la Frontera, Jimera de Libar, Montejaque, Ronda and Algodonales are within Malaga . The park consists of 51,695 hectares of which the highest point is El Torreon at 1,654m. Imposing views of the park and beyond can be enjoyed from this bare limestone summit (only accessible on foot). These limestone mountains form the western tip of the Cordillera Betica range and there is only low lying land from here to the Atlantic coast. The warm, humid winds blow in from the Atlantic and cool and condense as they pass over these limestone peaks making Grazalema famous for being one of the wettest points in the Iberian Peninsula with an average of 2,153 mm of rain a year (In 1963 Grazalema recived a remarkable 4346mm), but with a marked summer drought, which has been partcularly pronounced in recent years. This high rainfall has helped creat the cliffs, crags, caves, sink holes, river valleys and gorges that make the area so varied. The most widespread vegetation form is the 420 hectares of Spanish Fir Abies Pinsapo which is a relic that has survived since the last ice age. Spanish fir are mostly found on the Northern slopes of El Pinar (accessible by footpath) but some smaller groups and younger examples can be seen on the road between Zahara de la Sierra and Puerto de las Palomas (this is a tarmac mountain pass). The Spanish Fir, Grazalema poppy (Papaver rupifragum) and an endemic fern (Asplenium petrarchae subsp bivalens) each are in the Red List of Endangered Species. Phlomis x margaritae, Erodium recoderi and Echinospartum algibicum among others are unique to the area. Holm oak and pine forests clothe the slopes, there are also Cork oak woods (Quercus suber), Carob (Ceratonia siliqua), Junipers, Strawberry trees (Arbutus unedo) and a tapestry of Mediterranean scrub. The range of wild flowers defies description with the spring time becoming a riot of colour. Griffon vultures soar over the whole park and several of the cliffs have resident groups. The massif being home to one of the largest colonies in Europe . There is a viewing platform within Garganta Verde (which has several hundred nesting birds) where they can pass quite close by as they fly in to the ledges. A telescope will allow you to watch the young birds. From February to August they are busy nest building, incubating and then feeding the young. Golden, Bonelli´s, Short-toed and Booted eagles are all within the park as are Peregrine, Sparrowhawk, Eagle owl, Osprey and Egyptian vulture. Red billed chough, Blue rock thrush, Rock thrush, Black wheatear and numerous warblers enjoy the mountains and scrub while Red legged partridge, Hoopoe, Bee-eater, Hawfinch, great spotted woodpecker and Golden orioles are found in the lower areas. Wild Mountain Goat ( Capra pyrenaica hispanica) populate all of the higher areas and can also frequently be seen near to the road between El Bosque and Grazalema. Most of the mammals in the park are nocturnal, so therefore are difficult to see such as Wild boar, Fox, Badger, Genet, European Mongoose, Wild cat and Beech martin. Red deer and Roe deer have been introduced for game hunting and the Fallow deer is moving in from the Cork Oak forest to the South. Man has lived in this lush area from prehistoric times. (Cave paintings can be seen in Cueva de la Pileta.) The Romans inhabited Iptuci (Prado del Rey) and Ocuri (Ubrique). They also had an important town and mint at Acinipo just outside the park area. The famous white washed villages (Pueblos Blancos) with their steep, narrow streets are based on Arab designs. During the 13th and 14th century it was a border zone between the Arab Kingdom of Granada and the Christian Kingdom of Castilla. The traditional work includes raising livestock, making goat’s cheese, farming trout, growing and pressing olives and crafts are weaving woolen blankets, basketry from esparto grass and leather work. More recent employment is park / forest management and tourism. The main centre is in El Bosque as this is the gateway into the park from the west. From here permission can be obtained to enter restricted areas of the park; Garganta Verde, Llano de Ravel, El Torreon, El Pinsapar (the latter two closed July and August for fire risk). El Castillo botanical garden gives easy viewing to the plant life of the sierras that may otherwise be difficult to find and identify. Also in the town a water powered flour mill has recently been renovated. Grazalema is well known for its loom woven wool products. An old style olive press is situated at Zahara and here they sell their organic oil. General Description Grazalema is located in the southwestern part of Sevilla, in the hydrographic complex of Cádiz. 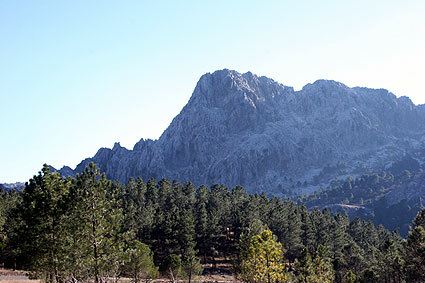 It is also situated in the extreme western side of the ‘Beticas’ mountain chains in the ‘Serranía de Grazalema’ comprising the Pinar, Zafalgar, Monte Prieto and Margarita’s mountains. It consists of a massif karstic limestone with closed river basins, headstreams of the Guadalete and Majacete’s Rivers and tributaries of the Guadiaro. 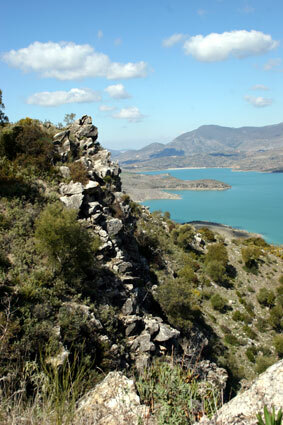 It also comprises a mountain lagoon called ‘Laguna del Perezoso’. The relief is very complicated and abrupt, comprising very jagged crests and cavernous karstic plateau, with precipitous edges. The Sierra, the highest in the province of Cádiz, stands like a great spur overlooking the whole territory. The biosphere reserve contains a wealth of floral diversity, with some 700 species of vascular plants catalogued to date. Eighteen higher vegetation types have been found including evergreen sclerophyllous forests, woodlands and scrub. The core area comprises 300 hectares of Spanish fir (Abies pinsapo) forest, including carob tree woods, pine and fir woods. More than 8,000 inhabitants (2001) live in the biosphere reserve. In the low zones, cattle and sheep are allowed to graze with some restrictions. After nine years of protection, the Grazalema pine forest is rapidly evolving towards a state of equilibrium. An initiative to restock the karst-like deteriorated hills with standing shrubs and luxuriant creepers is being developed.